You are visiting: Home » Decorating/DIY » Decorate Your Home » I Need You to Help Me Figure Out My Flooring Woes. I Need You to Help Me Figure Out My Flooring Woes. What happens when you put your dogs in your bedroom and shut the door? And they really, really want to get out and play with the team of Destination Imagination kids who are practicing their skit in your living room? Wait, that’s a lie. Something big happens. Welcome to my bedroom, y’all. Yaaaaayyyy. Isn’t that awesome? And honestly, this is not the first time this has happened. The dog who did this has done this before in the exact same spot, and we had it repaired because he didn’t go all the way down to the pad. But this time, I don’t think there’s any way that we can fix it. Thanks, Jack. It’s a good thing he’s so pretty and sweet. Our carpet has been used and abused and is almost 9 years old. So, it’s time to shell out the money and get it replaced. I’m not excited about spending the money, but I am excited about having new floors. We currently have carpet in our master bedroom, living room and dining room. The rest of the first floor is tile. Upstairs we also have carpet, but it’s in pretty good shape. This is the most cost effective option. I know that I will have the same problems with the carpet that I have now – like stains and foot traffic – and the opportunity for Jack to rip it up again. I’d have to match the color pretty close to what I have now, since our carpeted staircase is right next to the living room (and I don’t want to replace the carpet on the stairs and upstairs at this time). And if I’m being honest, I want something more fun than carpet. I really love all of the wood grain tiles that are on the market right now. Tile is so easy to maintain, but it is loud. Our living room is an open to a two story ceiling, so will that be too loud? And is it okay to have two different types of tile on one floor (the entry way and kitchen/breakfast room has basic 12×12 beige tile) or should we replace all of our tile? I have never had laminate before, so I really don’t know how “livable” it will be with dogs, kids and lots of DIY projects. It will be cheaper than wood look tile (I think), and it will feel more like wood. But does it get scratched up super easily? And I know there are all sorts of different thicknesses, so what should I look for? Let’s be honest. In a perfect world where money was no option, I would definitely go this route. Unfortunately, this is not the world I live in! It’s absolutely gorgeous, but I’m just not sure that it’s the best choice for my house. 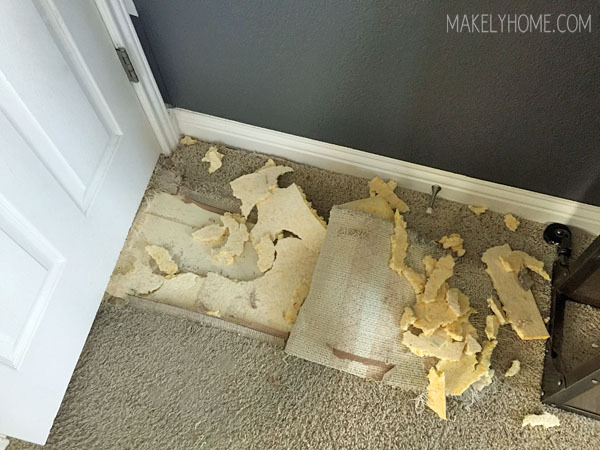 If my dog can do that to carpet, imagine what he could do to hardwood! So really, I need your help. Which of these options have you gone with, and why did you choose them? Did you DIY or pay to have it installed? Is there another option I haven’t considered? Man, I can talk about paint and the best type to use all day long. But flooring? I feel almost paralyzed at the thought. Knowing your dog’s history, I would avoid carpet and wood. Laminate can be scratched, too. Just ask my son with his wood-look laminate flooring in his brand-spanking new house and his three big dogs. Tile is the best option, and I love the wood-look porcelain tile. Yes, it’s loud, but it can be softened by area rugs, drapes, upholstered furnishings, accents, etc. It’s easier to clean than carpeting, too. In the long-run, it may be your most cost-effective choice. I’ve had all of these, and while I love the hardwood flooring, tile would be my choice for easy-care durability. I’m definitely leaning this way! Thanks! I have the wood look tile in all my bedrooms with 18×18 ceramic in the other rooms all on one floor in my house and I think this looks just fine. One thing about the wood look, we have fairly dark tile and it requires dusting (swiffering) almost every other day or you can really see the dust and pet hair. Lindsay, we installed wood grain tile in our home and LOVE it! It is so durable, we’ve had spills and dragged furniture around and it’s been so good not having to worry about scratches or anything else! Home Depot has a ton of options. They even have two new wood tones since we purchased ours last year. Love the new colors!! Ok, I’ll check out HD for sure. Thanks for that suggestion, Cindy! I’ve seen the pictures of your floors, and they are gorgeous. We tore out our downstairs carpet and replaced it with laminate, 1000sf worth, which turned into the everlasting DIY project, but we are SO HAPPY with how it turned out. 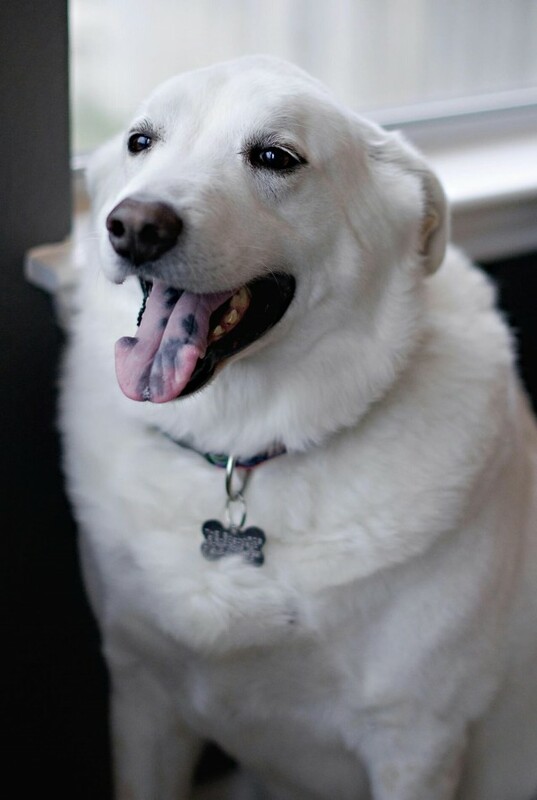 Our home will eventually be a rental, so durability was key, plus we have a large and very active dog. We chose home decorator laminate, which was very cost effective and has a 50 year residential warranty. It’s been in almost a year, and not a single scratch. Before we bought, we took samples home of multiple brands and tried our hardest to scratch and damage them, there was a definite difference between brands more so than between thicknesses. We went for a mid-price underlayment and it made a big difference vs the cheap stuff. The floor is quite slippery for the pets, more so than hardwood would be. We chose a walnut tone, and it looks great next to the beige tile in our bathrooms and laundry room. We had laminate in our old house and stood up to three kids. After living there for seven years there were only two small scratches on the entire thing. Now we’ve moved and have real hardwood floors and I can’t begin to tell you how many debts and scratches our floors have. It’s depressing and we’ve only lived here 6 months. Man, that’s a bummer. I’m sorry to hear that about the hardwoods! Can’t speak to what kind of floor to install, as i have a house full of ugly 70s carpet that needs changing. Much of it hidden under rugs. I want to sell and it seems a waste of cash to put down anything now, as a buyer might hate it and tear it out or want a discount for flooring….. I can help with the dog, even though it’ s a bit late. It is a good thing for a dog to have a crate large enough to lie down in comfortably. stand up straight, and sit upright in. When you leave Jack in a room, he will be calm in the crate and will not tear up anything as he waits patiently wait for you. He’ll signal if he needs to go out, and you can pay attention to your guests, or whatever keeps you occupied. This is a replacement for the cave or den the dog’s ancestors lived in and is a good thing for him, not cruel. If you have visiting children, they will learn that the crate is a safe place and he is not to be disturbed. Today i saw online a crate for a large dog made from a baby crib. You might google it so you can see how nice it looks and how happy the dog in it. Then you won’t have to worry about your flooring, doors, or walls being trashed by an anxious, upset dog. I don’t mean to be a know it all, but I’ve been there and feel this is something not enough dog lovers know about. Google it and see how you can make a crate to fit in your style of decor. I’m computer illiteraet but if i can find it , i’ll send link to you. Cheerio! I am a total believer in crates. Our smaller dog had to be crated when we left the house, because he was destructive. He seems to have outgrown that behavior, but he’ll some times surprise us and shred a box of tissue while we are in the other room. He still gets in it occasionally, though, and the kids know to leave him alone when he’s in it. The problem is that the big dog – Jack – is human sized, so we would need a huge crate! The crib crate is a great idea, though. Thanks for sending that link! Do yourself a favor and consider luxury vinyl planking. It works beautifully, looks really great, can be replaced individually and can be a diy if you want. It doesn’t need glueing and goes together like laminate flooring. We use it in our rentals and it looks dynamite. We would have it in the house, but we have stained concrete and love it. I totally forgot that was an option! It is something we considered, and my parents actually have that in their house (they live on the water). Thanks for the reminder! Out of all the options you said…..I would pick the tile. Laminate….it just has too many negatives in my book. Engineered hardwood both my sister and I have it and we have both gotten scratches and we don’t have dogs and are pretty low traffic. I’m a big fan of polished concrete floors. My solution would be to go with a tile and use a room carpet you can get them for reasonable $ if needed. PS as we all know we get what we pay for….and in my opinion we all need to think about purchasing the best we can afford at the time. Maybe you have a discount store that has tile at reasonable price or Craigs list? Wood look tile! Do NOT do carpet again. I repeat, DO NOT. Also, I love you. And Jack. We did laminate from Lumber Liquidators about 4.5 years ago and it was a wonderful decision. We have a large dog (with long nails) and a two year old and they are still in perfect condition. I would highly recommend them! We are having to replace flooring after a flood and have opted for wood look vinyl plank. There’s some pretty low end stuff out there, but if you go for something like Shaw Floorte or a Karndean product those should hold up really well. We have kids, not pets, so I can’t actually speak to the pet thing, but after doing scratch tests and looking for a good wear layer, I’m really hopeful! Hope you find something you love, and everyone (dogs too!) can live with! I would actually consider vinyl planks. We did our whole main floor with a wood-look plank from Mannington http://www.mannington.com/Residential/LuxuryVinylSheet/Search?FilterCollections=3 and it looks great, is super durable and is still soft underfoot. We are so happy with our choice and recommend it all the time!